Spanish statesman; born about 1031; died Dec. 30, 1066; son of Samuel ibn Nagdela. A highly educated and clever man, he succeeded his father as vizier and as rabbi of the community of Granada, directing at the same time an important school. Arabic chroniclers strangely relate that he believed neither in the faith of his fathers nor in any other faith. It may also be doubted that he openly declared the principles of Islam to be absurd (Dozy, "Geschichte der Mauren in Spanien," ii. 301). Devoted to learning, he aided many students, e.g., Isaac ben Baruch ibn Albalia, the Talmudist, and the poet Isaac ibn Ghayyat. Arabic poets also praise his liberality. In contrast to his father, Joseph was proud and haughty. He completely ruled King Badis, who was nearly always drunk, and surrounded him with spies, who reported every word of the king. Holding the reins of government, he appointed his coreligionists to public offices with such frequency as to attract attention. He was also accused of several acts of violence. These things combined to draw upon him the hatred of the Berbers, who were the ruling majority at Granada. The most bitter among his many enemies, Abu Isḥaḳ of Elvira, a fanatical Arabic poet whose hopes of obtaining an office at court had been frustrated by Joseph, wrote a malicious poem against him and his coreligionists. This poem made little impression upon the king, who trusted Joseph implicitly; but it created a great sensation among the Berbers. They spread a report to the effect that Joseph intended to kill Badis, and to deliver the realm into the hands of Al-Mu'taṣim of Almeria, with whom the king was at war: then, killing Al-Mu'taṣim in turn, to seize the throne himself. This calumny was made the pretext for disgracing Joseph and plundering the Jews. The mob stormed the royal palace, where Joseph had sought refuge at the beginning of the riot, hiding in a coal-pit, and having blackened his face so as to make himself unrecognizable. He was, however, discovered and killed, and his body was hanged on a cross. Most of the Jews of Granada also perished. Joseph's wife, a daughter of R. Nissim ben Jacob, fled to Lucena with her son Azariah, where she was supported by the community. Azariah died in early youth. Nothing is known of Joseph's literary work. 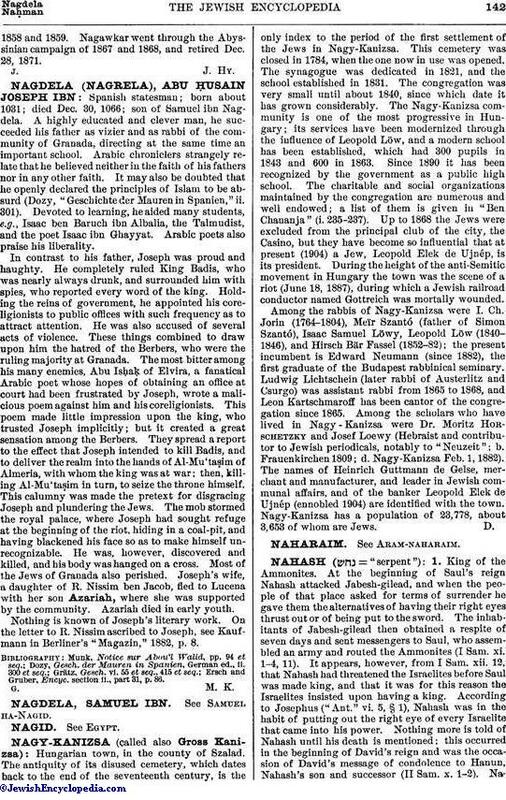 On the letter to R. Nissim ascribed to Joseph, see Kaufmann in Berliner's "Magazin," 1882, p. 8. Ersch and Gruber, Encyc. section ii., part 31, p. 86.